Cast: Irana Nuronshoeva, Alexander Michkov, Aliakbar Odinamamadov, Dzhonboz Dushanbiev, Mussavar Minakov, Natalia Cherniavskaya. A young Russian lad falls in love with a young Tajik migrant girl from the mountains. The lovers run against a wall of mistrust, because of traditional stereotypes and a lack of understanding. 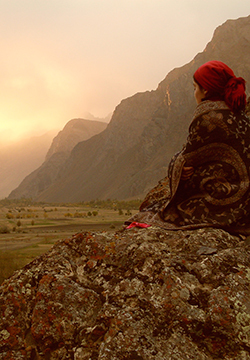 The film shows the unique folklore of the peoples of the Pamir. Born in Khorog in 1972. Graduated from the Film Institute VGIK as theatre and film actor (1993, class of M. Gluzsky), and director’s faculty at the Institute of Advanced Qualifications at VGIK (1996, class of V. Naumov).